I am in the process of completing my first legitimate novel. This is the first in hopefully quite a few updates on how the hector it's going. Notice I didn't say just first novel, because I've written those before. The very first one came in sixth grade when I wrote an epic sci-fi space battle involving an army of evil pigs. Although I don't remember exactly what happened in the story, I do remember the pride from getting over 50,000 words. The second came my senior year in high school when I wrote a love story between an angel, a demon, and the human child born between them. 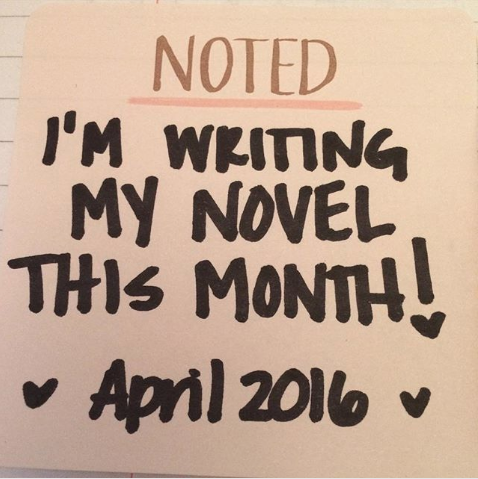 That was the first year I won NaNoWriMo and I felt like I could conquer the world. But I destroyed that story (literally deleted from all my hard drives and the internet) because it felt too obvious and cliched. The novel I'm working on now is the first legitimate novel because it's the first that I'm sticking with completely. I'm seeing it through revisions and I intend to publish it. It's a story that's plagued me for years (since before the angel/demon novel, actually) in some form or another, and I've patiently waited as the muse took her sweet time in revealing the true story to me. It's a story I believe in, a story I would be proud to share with the world, a story I intend to finish. But that doesn't mean the revision process is easy. For a long time I've been in the dark of what actually writing a whole novel looks like. I believed it was straightforward: writing chapter one, then chapter two, all the way to "the end". Then I believed you printed the thing, marked it up, and called it a day. It sounds so simple, so easy. In reality, at least for me, the process doesn't really look like that. 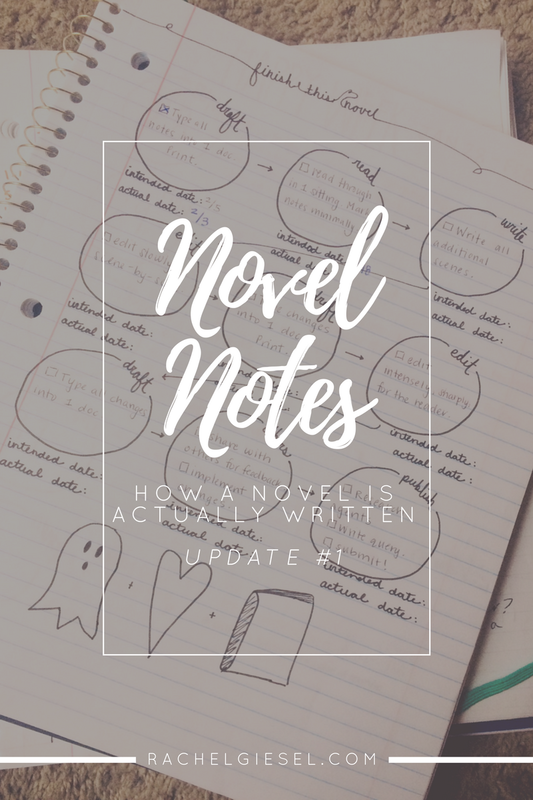 I'm sharing my process–the good, the bad, the epically messy–to document the novel-writing reality that's true to me. Hopefully, if you're writing a novel and struggling with questions of "Am I doing it right? ", sharing my process will give you the confidence and calm that no matter how messy and crazy your draft is, you can get through it. So, here's what this novel has been through so far and what's yet to come! Once upon a time, there was a silly ghost story that haunted a road about an hour away from where I lived. Real life. This wasn't a spooky, scary, murderous type of ghost, but a supposed energy that had been trapped because of an unfilled romantic love. Apparently, dude had been trying to get to his girlfriend, somehow died in various versions of a car wreck while getting there, and his energy was trapped because his love was so strong. If you went to where he died, you could see his ghost. As an overly-romantic and supernatural-loving teenager, I became obsessed. I went ghost hunting. I researched the practicality of ghosts. I wrote an article about it in the school newspaper. I never found evidence of an actual ghost, nor did I ever really see said "ghost", and all my research pointed to the fact that this ghost story (my ghost story) was nothing more than a story. But I wanted to believe. I wanted ghosts to be real, love to be real. So I wrote it real in story form. 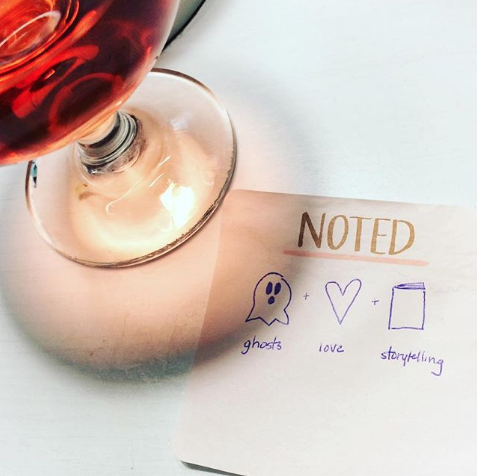 I made the ghost come to life in fiction–a walking, talking dude trapped in time and space as he endlessly tried to get to his lover. It was horribly bad, horribly cliche. But it was the first attempt by my muse to complete this project about ghosts and love and storytelling. I took a few years off from this project as I entered college and began to study fiction seriously. I wrote a wide variety of other stories, studied great works, learned how to be a writer. But while I was researching and writing my thesis, this story came back to me. It didn't come in the form of investigating the practicality of the supernatural, understanding the emotions of a literal ghost, but the looking at why the story of the ghost existed at all. I submitted a long short story (maybe closer to novella length) with this idea as part of my senior thesis. My department praised it and it's part of the reason I was awarded the Ione Sandberg Shriber Award when I graduated. They thought it was captivating, bizarre, authentic. I thought it wasn't finished. I thought the true story could only be revealed in full through the novel form. I spent the next two years (or so) writing the story to understand it. I took wild turns and deep character dives. I wrote randomly and inconsistently in various notebooks. I didn't yet have a fully developed plot, and so it was filled with many plot holes. I allowed the muse to run away uncensored, and so I took many wrong turns that had to be later deleted. I didn't write chronologically, because I didn't have a chronology, and so I ended up with paragraphs here and there that somehow had to be organized and connected together. I decided to get more serious in April of 2016. I made scene cards and spent three days on the floor of my apartment arranging and rearranging and scribbling notes and rearranging again. I found the linear and logical trajectory of my characters' motivations and my plot. I discovered the beginning, middle, and end. I wrote a full outline. I set serious intentions. I typed this in the computer with organization, allowing myself to leave holes where I knew I needed to add more information later. I wrote and wrote and wrote, not caring if it was bad, not caring if it was messy, not caring about perfection at all. It was difficult. I knew where the story was supposed to go. I knew what was supposed to happen. I knew how to do it. But it just didn't really feel right. It felt forced, cliched, formulaic. I struggled with how to reach the ending and make it feel true. I wrote various endings, experimented with different versions, asked family members and friends to help me sort through these troubles. I came up empty handed. I could make the story work. I could make the story logically be a story. But I couldn't make the story in a way that felt right to me. I shelved it from May 2016-February 2017. Didn't write a word. And felt very guilty for not writing. Nearly a year later, my brain still couldn't escape this story. I had tried to write new things (and I did a little bit) but my muse kept going back to this novel again and again and again. At the wise advice of the amazing writing teacher Holly Lisle, I wrote a description of the "perfect" novel that I wanted this story to be. I asked the muse to give me the answers to my plot questions. I waited. I read a lot. I studied books I thought would be comparable to mine, looking specifically at endings and pacing and internal dialogue (some favorites being To Rise Again at a Decent Hour, Atonement, The Girls Guide to Hunting and Fishing, and The Brief Wondrous Life of Oscar Wao). Finally, somehow someway, I figured out a new ending. I wrote a whole four-page synopsis of beginning, middle, and end in one fluid stream-of-conscious flow. The muse had appeared and answered all my questions. The novel would work! I went back to my draft from a year ago and printed it all out on paper. As I read through it, I realized much of what I'd written did not align with where this story needed to be. I literally cut the pages up, leaving scraps and discarded words on the floor, stapling bits of scenes to each other. I got rid of nearly half of what I'd written. I also noticed I'd missed some pieces I knew I had written. I'd forgotten that I had continued to write new scenes, new descriptions, new pieces every time I found myself with a writing prompt. I flipped back through my notebook, then an older notebook, and another one, and discovered pages and pages of my novel that hadn't even been typed up. I rediscovered this novel, fell in love with it, and began to put the pieces together. In attempt to organize this, I put Post-Its on each of the pages of my notebooks that needed to be typed in. I wrote myself notes on the draft that correlated with a Post-It in my notebook of the pieces that scene was missing. Much of my writing retreat last year was devoted to organizing the mess that is my brain and my writing process with this draft. I started to retype this novel back into the computer, with the handwritten edits, with the random paragraphs and Post-Its that had never been preserved in digital form, with even more organization and flow. But then my non-writing life got crazy, and my mind went elsewhere. I left my job, started teaching high school, became an eager yet endlessly overwhelmed first-year teacher (you can read all about what I did in 2017 and this craziness right here). I didn't have time or mental capacity for the novel. I got frustrated with the novel because I was frustrated with life. And then I was just too busy. I shelved the novel again from June 2017-January 2018. I'm still an overwhelmed first-year high school English teacher. I'm still busy. But I also still can't escape this novel. Over my school's winter break, I pulled my notes back out and began to dive into this novel again. And I subsequently fell in love with it again. I also realized I had a TON of work to do. When my non-writing life had a moment last year, I stopped right in the middle of my organized chaos of typed-draft and non-typed-draft and never-ending Post-It notes. I didn't leave myself any clues to what I'd figured out. I didn't tell myself where I'd left off. I didn't tell myself what I had already done and what I still needed to do. I just literally walked away. If you learn anything from this blog post, please learn to not ever ever ever ever ever do this. It is damn near impossible to pick up the middle of a project when you don't have momentum, when you don't know what's happening, when you aren't even sure what your hand-scribbled notes mean anymore. In the seemingly short seven months I was away from my novel, I had forgotten what the heck I had been doing and I had to decipher my own brain to put the pieces back together again. It was like I had already organized all the puzzle pieces in order of how they would go together, and then just threw them back in the box to make a whole big mess of them again. It wasn't fun. It wasn't easy. The next time I have to walk away from a project, I'm absolutely 100% going to leave myself detailed notes of what the heck my brain was doing so I don't have to come back to my hot-mess-express of a draft like a detective trying to solve an unsolvable case. In January 2018, I worked to understand my own brain, my own notes, and finish assembling this story into a full draft. On February 3, 2018, I printed the whole thing in completed form. This is Draft Three. "Draft Three" is the first real-looking draft. It's the first time the whole novel has existed in typed, printed form without being cut in half and stapled back together and littered with Post-Its. It's the first time the whole novel has had a beginning, middle, and end together, with full transitions included. It's the first time the whole novel has really looked like a novel. Some people might consider this a first draft. But that doesn't account for all the growth this novel has seen. When I discussed my revision process previously on this blog, I discovered that I don't have a linear way of approaching a project; it's much more like building the bits and pieces of a human, Frankensteining the story together. I write the skeleton, flesh out the heart and muscles, add some freckles, give it a checkup, then hire a trainer to make it strong. Looking at my process for this novel, I can see my bare-boned Skeleton draft as my first attempt. I can see how I looked through macro issues in plot and logic in order to make it to Draft Two. I can see how during Draft Two I added the muscles, the heart, and really fleshed out my draft, as evidenced through my continuation of new paragraphs, new scenes, and new descriptions all over the notebooks of my life. I can see how to get out of Draft Two, I had to put the pieces together, discover my why for this novel, and really commit to this thing. And now I'm on Draft Three. I've finally (finally!) after years and years of efforts and struggles with this project, reached the point in my process that looks like revision. Continuing to follow my revision phases I complete with a short story, I'm now on the Freckle Phase of building my human/novel, where I'll go through this novel chapter-by-chapter, scene-by-scene. It's time to focus not on global issues like plot and flow, but more specific issues: strengthening word choices, enhancing symbols, deepening descriptions, showing character internalization and externalization effectively. This is where the red pen and the checklist come out. It's time to revise. To keep myself organized, I've mapped hopeful deadlines, created productivity trackers, set intentions for rewards for completing chapter revisions. I've also installed a plan to write myself notes of where I leave off so I don't accidentally throw all the puzzle pieces back in the box again. I'm ready to tackle this revision, or as ready as I'm going to be. My novel writing and revision process isn't pretty. To be more accurate, it's really a hot-mess-express. It's messy, unorganized, and a bit crazy. It's taken a long long long time. But that's how things are working in my world right now. If your process is more linear and straightforward, good for you. I admire your organization. But if it isn't, accept your process as just fine for you. There's nothing wrong with taking a long time to complete something. There's nothing wrong with stepping away from your project because life gets in the way. There's nothing wrong with having a super duper crazy-messy draft that you have to work really hard to uncover. Trust yourself that if this story is important, you will return to it and make it work, at some point, and in some way. I'll keep posting about my novel revision process as it happens. I don't know what to expect and I don't know how long it'll take because I can't predict the future. But I do promise to document my process to show that you don't have to be a straightforward or organized writer to complete your writing dreams. What does your novel writing process look like? What struggles have you faced? What tips do you have for organization with writing? What tips do you have with revision?